If the buzz at the Consumer Electronics Show is any indication of things to come (and it usually is), 2016 is expected to be the year of VR. Much anticipated VR headset launches, announcement of investment in enabling technologies and developments of optimised components made VR the words on everyone's lips at CES 2016. By Dr Harry Zervos, Principal Analyst, IDTechEx. The IDTechEx Research report on the topic of smartglasses, AR & VR Smartglasses and Functional Contact Lenses 2016-2026, discusses the growth expected in the space for VR headsets which the report finds are expected to already be shipping in volumes of over 10,000,000 units by 2019. Following up on the excitement around eye-worn computing, in this article IDTechEx will be discussing LCD, LED and OLED microdisplay technologies, as they will compete for integration into smartglasses - AR as well as VR ones - a market that is expected to experience significant growth with VR products leading the charge. Microdisplays, initially developed for large screen projectors found a perfectly matching application in head mounted displays. When Google Glass launched in 2013, it integrated a reflective, near-eye Liquid Crystal on Silicon (LCoS) display based on an LCoS chip from Himax Display. There are several suppliers of liquid crystal microdisplays that are currently available and have been integrated in different headsets. 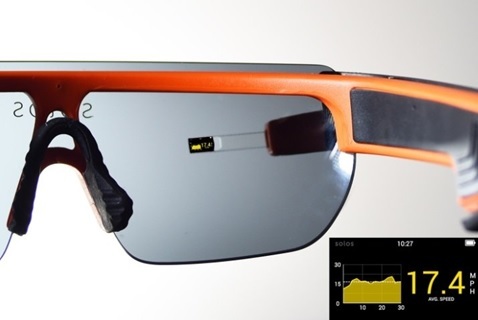 Kopin's transmissive LCD on single crystal silicon transistors has been utilised in smartglasses from Vuzix and Recon, as well as in the company's own brand headset, the Solos. Devices based on Ferroelectric Liquid Crystal on Silicon (FLCoS), having made a wide impact on applications as diverse as optical correlation and holographic projection, are also of interest here, as they are inherently faster switching than other liquid crystals. Non-emissive systems, like the LCoS described above, require an external lightsource with light always incident on every pixel, irrespective of whether said pixel is on or off, an undesirable trait for any portable application where battery life is paramount. Emissive types of displays rectify that problem and can be more energy efficient, one of the main reasons there is a significant interest in micro-OLED displays. Along with higher contrast, faster response time and a wider operating temperature range, µ-OLEDs have been used in prototypes such as the smartglasses from Atheer Labs, with several companies developing products worldwide (e.g. eMagin, Yunnan OLiGHTECK, MICROOLED). Unfortunately current generations of µ-OLEDs are limited in brightness and experience short device life-times when run in high brightness conditions. As a result, there is significant research and development effort in making brighter, longer-lifetime OLEDs, with prototypes that use direct colour emission rather than RGB colour filter arrays showing significant promise in that respect. Micro-LEDs, also an emissive display technology that benefits from reduced power consumption, have been demonstrated to operate efficiently at higher brightness than that of an OLED display and in that respect can deliver an emissive, high brightness solution. The drawback of LEDs is that they are inherently monochrome - the phosphors typically used in converting colour in LEDs do not scale well to small size - which leads to a requirement for more complicated device architectures and it is not yet clear how scalable these can be. Which will be the winning technology? 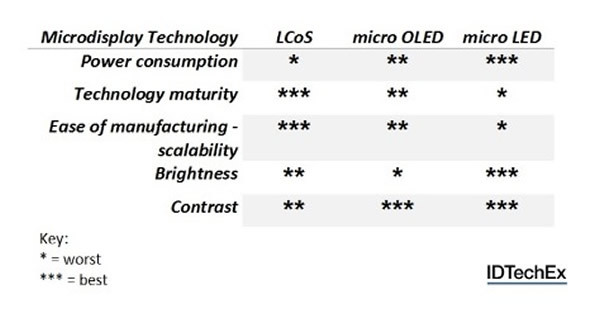 In the short to mid-term, the two major competing technologies are the two more mature ones; OLED and LCoS microdisplays. Other than the liquid crystal displays already in products, eMagin has just signed a non-exclusive agreement to supply its OLED microdisplay technology to an undisclosed client, with an $1m licensing fee as a down-payment, while other headset developers are testing OLED displays and their performance in their devices. Assuming that micro-LED technologies overcome challenges relating to manufacturing complexity and scalability we will potentially see them carving up market share in the future. VerLASE Technologies might be simplifying micro-LED structures (but also micro OLED structures too) with its revolutionary Chromover wavelength conversion technology.